A lucky guy that calls himself Walkero603 received his brand new AmigaOne X1000 motherboard a couple of days ago. Here’s a video of him unboxing the package. Enjoy the show! As a bonus, here’s a couple of pictures of the AmigaOne X1000 in the official white case. Photos by Dave Braco at http://www.amiga-ng.org. 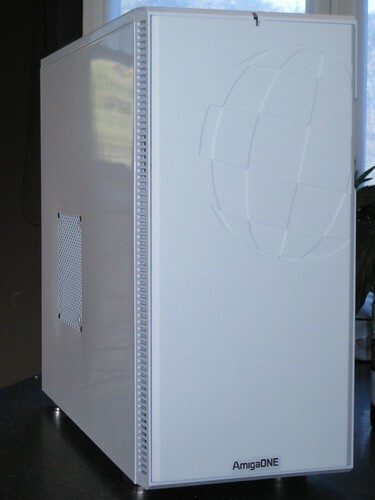 The AmigaOne X1000 in a white case by Dave Braco. The tower looks very classy in my opinion. 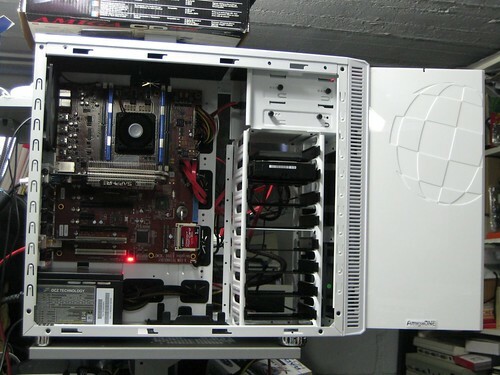 The AmigaOne X1000 in a white case by Dave Braco. Here we get a glimpse of the inside.. looks awesome! Seems like a few people are starting to receive their AmigaOne X1000’s. I’m sure they’ll have a great Christmas playing with the machine. 😉 Congratulations to all new AmigaOne X1000 owners! It’s worth mentioning that the “First Contact” limited edition batch was sold out quite quickly at AmigaKit.. If you’d like to see more of the AmigaOne X1000, please feel free to check out the post I wrote yesterday. There you’ll find a demonstration of the computer by Steve Jones (ClusterUK). I also recommend checking out the videos from AmiWest 2011, which you can find here. The speech by Trevor Dickinson is a must see! That is kind of what kept me from wanting to give the new Amigas a shot was the price tag. It is cool to see them, and actually see more options for computers out there, even though I am a Mac user. I do like seeing people having more of a choice besides the three systems (OS X, Windows, and Linux). Thanks for the comment. 🙂 I agree with you. It’s great when there is a variety of systems to choose from. But really looks a bit… Well… What about cooling system? The case looks too monolith. I saw one of the prototypes at the Vintage Computer fair at Bletchley Park the other year. Pretty cool stuff indeed but my initial thought was, whoa it’s a big en. Would be so much slicker in mATX or even ITX. Do you really need that many drive bays? Would still like to get my mitts on one though! Great to see that this baby finally came to fruition 🙂 I bet it feels like Christmas Eve for all those lucky AmigaOne X1000 owners who have been waiting for this moment for so long. I think the case looks good and it seems to be designed in a smart way. Most people won’t need all those drive bays for sure, but I assume they would come in handy for professional use. The PA6T-1682M processor has a TDP of 7W which is quite good for a processor of this kind. I wonder if a CPU fan is necessary at all? I think they could have used a larger heat sink as standard and made this a completely fanless design. After all, it’s a very expensive machine and it would not have cost them much extra to do so, I think. Now I hope this computer inspires people to write new and dedicated AMIGA software which actually exploits the machine’s full potential. That is what the Amiga community needs now. You’ve got a very good point there. Creating native and dedicated Amiga software is the way forward. 🙂 Let’s hope, as you wrote, that this will kickstart some new development. I sure hope so. First of all I’d like to apologize for replying so late. I agree with you points concerning the hardware from Commodore USA. It’s basically re-badged PC’s. They are not compatible with AmigaOS either.